Agnes means “lamb of God,” according to my friend Agnes. I would joke that I was walking with God when we walked daily. Truly, it was no joke. If God is love and the connection between us, then walking with Agnes was walking with God. Our walks were sacred. We walked nearly every day for a year and a half. Monday through Friday we got up at 5 am and walked about 2 miles from 5:15 to 5:45, year round. On the weekends, we slept in until 6:15 and doubled our mileage for a 4 mile jaunt. We texted each other every night to confirm, checking in with the weather and the temperature. I bought us each flashing safety lights that we wore around our waists when the mornings were dark. She bought us each a fleece top to layer on when the mornings were cold. Of course the reason for walking was fitness. I had a grueling schedule and a commute and couldn’t fit in exercise in any other way. She was launching her real estate career but still wanted to be home as much as possible for her three children and her husband. Having an early morning walking/fitness partner insured that we did our walk nearly every day. After all, Agnes was depending on me to show up. But really the reason for walking was friendship. I was the quiet, more reserved one, focused on family and career with seemingly little time for nurturing friendships. Agnes was the talkative, more effusive one. Indeed she is the connector, the glue for our entire neighborhood community. We were perhaps an unlikely pair. As the talker listened, and the listener talked, we shared everything with each other forming a deep bond. When I slid into indecision or reluctance to express my point of view, she asked questions creating a safe and nonjudgmental place for me to be me. I looked up to her as being funny and extroverted and energetic. She looked up to me as being intelligent and compassionate and honest. We started with the mundane. “What did you have for dinner last night?” led to lengthy conversations about food, recipes, and the Flat Belly diet. I am still skeptical of her Brussels Sprouts roasted with bacon but she swears they are delicious. She thinks my preparation of two batches of pasta at dinnertime (regular for the boys, whole wheat for the girls) is unwieldy and not going to happen in her family. We are both fans of Mark Bittman and his approach to food and cooking as we incorporate more vegetarian options into our repertoire and hope our families follow suit. We tackled movies, books, and current events. We both read Three Cups of Tea and later felt betrayed when the accusations against Greg Mortensen came out. Agnes is never afraid to ask a question or reveal that she doesn’t know something. I am more protective of how I appear outwardly, not wanting to reveal that I don’t know something. We usually had read the same articles in the New York Times the previous day and she would launch into her thoughts and questions about it – while allowing me the space to articulate my questions and thoughts as well, instead of pretending I had it all figured out. We shared our hopes, frustrations, and love for our children. We shared household tips, best buys, and ideas for birthday celebrations. We groused about our husbands and complained about ornery bosses and co-workers, while working through conflicts and sticky situations. We shared our family stories. Her Italian Catholic upbringing contrasted with my Aetheist upbringing as an only child. So different. And yet we were interconnected as busy working moms in the same neighborhood at mid-life (though she is quick to point out that she is three years younger than me and technically not a baby-boomer). “But you do believe in God.” She stated during one memorable conversation about religion. It was not a question. She understood that I was brought up without religion, but she saw the spiritual side of me and never questioned my faith even though I question it every day and am pretty sure most of the time that I do not believe in God, at least not in the sense of an omnipotent being. But her faith in my faith was unwavering. As our second winter of walking approached, I couldn’t face frigid, dark 5 am walks any more. I had discovered yoga and began to phase out walking with Agnes. I had embarked on a 9-month 200-hour teaching training program that required all my energy that wasn’t wrapped up in my work and my family. Busy Busy Busy! I am always busy doing, learning, achieving – leaving little time for friendships. Somehow the achievement of some goal seems more important than just being with another human being. As an only child, I can be self-absorbed and spotty when it comes to valuing relationships. Agnes said she missed me and missed our walks, but she did not express anger or outrage at being passed over for my latest pursuit. Indeed, she was supportive and one of my most loyal guinea pig students when I needed to practice teaching yoga. We always picked up where we left off and talked enthusiastically about some crucial topic of high interest to both of us. But there was a distance, a gap. I missed her, but I was busy busy busy. Last week (two years later) I was at her house using her blow dryer during the power outage. I had shared how the lack of a hair dryer was a source of both physical discomfort (my hair doesn’t dry and my head is cold!) and aesthetic discomfort (my hair just hangs limply, with no body or style!). “Come to my house right now and dry your hair!” she commanded. I obeyed. About the only good thing about the power outage is that I wasn’t busy busy busy, because there was no light in which to do anything. We talked for an hour, catching up on each other’s lives. My friend Agnes. A few hours later that same day another neighbor called me to tell me that Agnes’ husband had passed away suddenly. WHAT?! It was just unfathomable. What could I do for my friend Agnes who had taught me so much about life and friendship? I stopped by every day just wanting to be near her and to hold her hand, jealous of the more organized ladies of the neighborhood who seemed to have a knack for knowing what to do, praying that my presence was in some way a help to her. When she got up to give her eulogy at the funeral, I sobbed. My brave friend, how could this tragedy have happened? She stood up and shared her love for her husband and her sadness that he was gone and her profound understanding that he loved her and knew that she loved him. What a gift to know with certainty that you love and are loved. On the morning of the funeral, the daily thought from the Buddhist Tricycle was written just for the occasion. Funny how that happens. At times of crisis and heightened emotion, we remember that it is important to live every day like it is our last. It is during the ordinary times that it is hard to hang onto this wisdom. As Agnes rebuilds, I hope to be a friend to her as dearly as she has been a friend to me. We’re going to begin with some walks. Preheat oven to 450°F. Trim the hard edge of the stem from the Brussels sprouts, then cut each in half through its axis. Put the oil in a large oven proof skillet over medium-high heat. 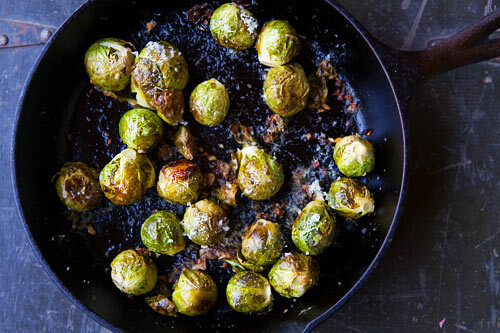 When it shimmers, arrange the sprouts in one layer, cut side down. Toss in the garlic and sprinkle with salt and pepper. Cook, undisturbed, until the sprouts begin to brown, 5 to 10 minutes, then transfer to the oven. Cook, shaking the pan occasionally, until the sprouts are quite brown and tender, about 30 minutes. Taste and adjust the seasoning; drizzle with the balsamic vinegar, stir, and serve hot or warm. There is always at least one thought or statement in your blog that makes me go ‘hmmmmm…..’ this time it was that being an only child may contribute to valuing achievement over relationships. Could there be a shred of truth in this for me (also an only child)? Hmmmmm…….. Thanks for sharing your ruminations!